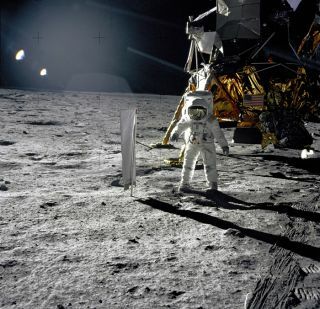 Astronaut Edwin E. Aldrin, Jr. stands next to a solar wind experiment during the Apollo 11 EVA in July of 1969. In this historical photo from the U.S. space agency, Astronaut Edwin E. Aldrin, Jr., Lunar Module pilot, is photographed during the Apollo 11 extravehicular activity (EVA) on the lunar surface. In the right background is the Lunar Module "Eagle." On Aldrin's right is the Solar Wind Composition (SWC) experiment already deployed. This photograph was taken by Neil A. Armstrong with a 70mm lunar surface camera.